A galaxy is a mass of billions of stars. The Milky Way is our galaxy, whom we can see a spiral arm during a clear night. 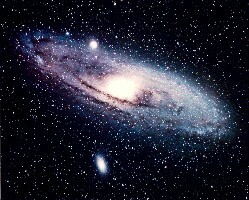 The closest spiral galaxy, and most probably looking alike ours, is Andromeda galaxy, also named M31 (from the Messier catalogue), located at about 3 millions light years from us. Our galaxy owns two small galaxies that are in orbit and that are named the Small and the Large Magellanig Cloud (SMC & LMC), discovered by Magellan in 1519.